FSD Sync creates a connection between FSDirect and Event Manager. Events that are entered into FSDirect will come over to Event Manager. This function will only work for those Locations that have been synced, or mapped, between the two programs. Click on FSD Sync under Global Administration. Check the box next to Allow event submissions. This turns on the sync and tells the system to send events from synced FSDirect Locations to Event Manager. Enter the FSD user email and FSD user password for the FSDirect Account Owner. Click on Enable FSD Sync. After clicking Enable FSD Sync, a list of all FSDirect Locations will populate on the screen. In the drop down menu to the right of the FSDirect Location, select the associated Event Manager Site Name. 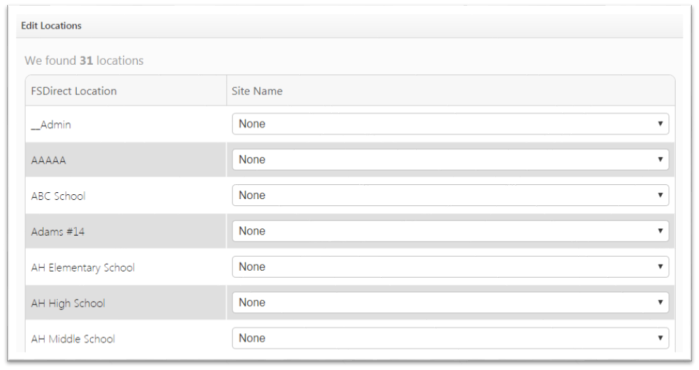 *Note: If there are FSDirect Locations you do not want to include in the sync, do not select an Event Manager site in the drop down menu for those locations. For the Sync to function properly, you will need to have set up your FSDirect account to have at least one separate Location for each Calendar Site you need synced. After you have synced all the FSDirect Locations needed, click Save. To modify this list of synced FSDirect locations, click Edit Locations. Make the necessary changes, and click Save. If needed, you can re-sync your FSDirect events with Event Manager by clicking the Re-Sync button. This acts as a refresh button if you find some of your events have not come over from FSDirect. *Note: If you click the Re-Sync button, the system will overwrite all events that have been brought into Event Manager from FSDirect and will overwrite any changes you may have made to those events in Event Manager, such as pictures, categories, highlights, etc. If you need to disable the sync, click Disable FSD Sync. Disabling the Sync means no more FSDirect events will come over to Event Manager. Any events that already synced from FSDirect to Event Manager will remain on the calendar. You can always re-enable the Sync if needed, but you will need to map your locations again. When an event comes over from FSDirect, the FSDirect Organization listed on the schedule will be created as a Category in Event Manager. This Category is editable on the Event Manager event.